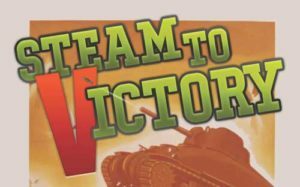 Welcome to the first Age of Steam Roundhouse Report! 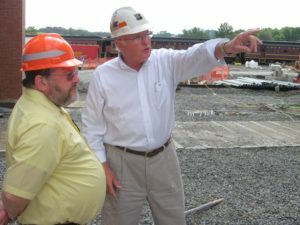 The year 2010 is an exciting start for the Age of Steam Roundhouse in Sugarcreek Ohio. This project marks the beginning of a new era of steam locomotive restoration and preservation. 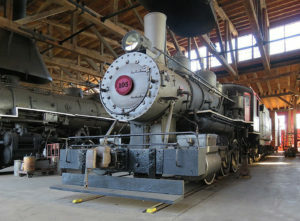 The Age of Steam Roundhouse (AOSR) has retained 22 diesel locomotives including models made by ALCO, EMD, General Electric and Fairbanks Morse. Last fall these engines were inspected and prepared for movement to the roundhouse site. This was a time consuming task that took several weeks of preparation. The movements of the engines were safely made using our own EMD FP40’s and an Alco RS1800. You can see some of these locomotives stored in the AOSR yard in the Aerial Shots from November 2009.
conjunction with the movement of the diesel fleet out of storage at Morgan Run. All of this equipment—including ex-NKP 2-8-4 #763—made the journey to the roundhouse site last fall in a safe and timely manner. The remainder of the steam locomotive roster will be prepared for dead-in-tow movement to the site after completion of the roundhouse’s stalls and tracks. This work will include the dropping of main rods, testing of brake systems, and lubrication to axles and other points. Replacement of wooden end beams of the tenders for ex-Canadian National H6g-class 4-6-0 #1551 and E10-class 2-6-0 #96 will be accomplished with locally grown Amish oak timbers. The shop support equipment, such as lathes, milling machines, drill presses and a long list of other machinery will be moved by truck from their current site in the Ohio Central Railroad Morgan Run Shop to the new AOSR Backshop now being constructed. Various other parts and shop supplies will be boxed and transported to the new storehouse that is also under construction. G5d No. 1293 is undergoing an annual inspection and some running repairs in preparation for 2010 operations. The 1293 has been the workhorse of our fleet for the past few years and has always been a favorite with crew and public alike. We’re planning to have her fired up to assist on some of the rail equipment moves to the new facility. It will be a great day when we move these fine examples of steam locomotives out of Mother Nature’s elements and into their own warm, dry stalls inside our new roundhouse. spare parts and other store house items will have to be boxed and transported to the site of the new storehouse near the roundhouse, also planned for construction later this year.